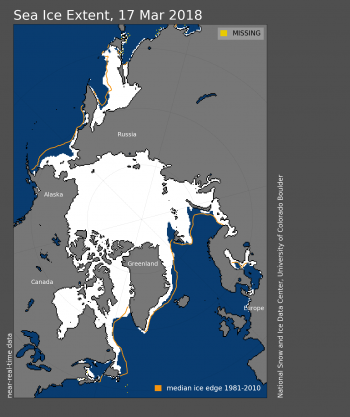 March 27, 2018 – by Arctic Sea Ice News and Analysis – Arctic sea ice appears to have reached its annual maximum extent on March 17. This is the second lowest Arctic maximum in the 39-year satellite record. The four lowest maximum extents in the satellite record have all occurred in the past four years. NSIDC will post a detailed analysis of the 2017 to 2018 winter sea ice conditions in our regular monthly post in early April. Figure 2. 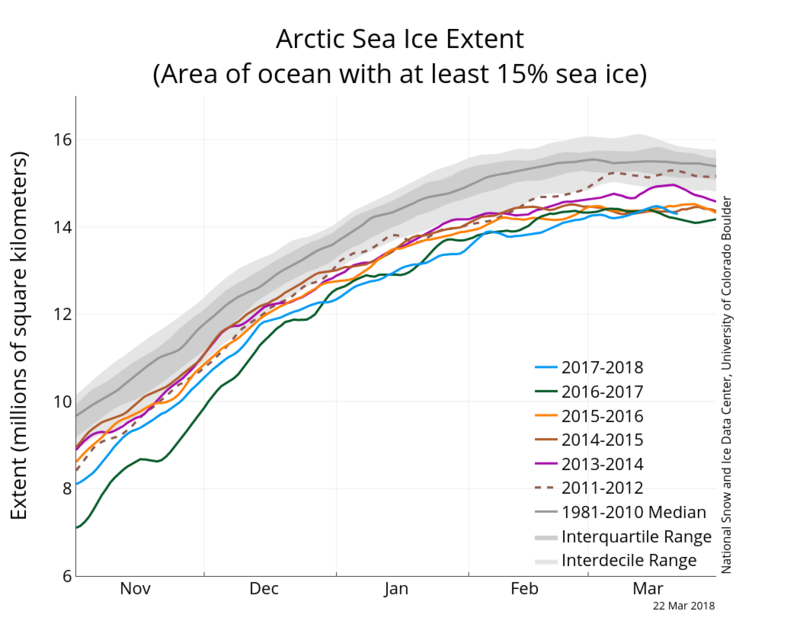 The graph above shows Arctic sea ice extent as of March 22, 2018, along with daily ice extent data for five previous years. 2017 to 2018 is shown in blue, 2016 to 2017 in green, 2015 to 2016 in orange, 2014 to 2015 in brown, 2013 to 2012 in magenta, and 2011 to 2012 in dashed brown. The 1981 to 2010 median is in dark gray. The gray areas around the median line show the interquartile and interdecile ranges of the data. 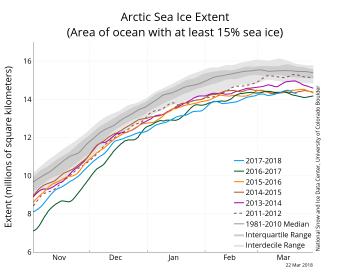 Sea Ice Indexdata.